The Kinkaid Middle School cultivates and nurtures creative learners who work collaboratively, communicate effectively, and examine critically – traits and skills that are crucial to success in today’s global society. In the One:World classroom, learning is no longer bound by four walls, and students are encouraged to seek out new and innovative ways to research, create, challenge, question, and share. Students take ownership of their learning, and inquisitive critical thinkers are grown. The One:World initiative puts technology in the hands of each of our students to provide nearly immediate access to information as well as uncharted connection to places and people around the world. As such, technology supports the very skills we strive to teach, and importantly, becomes a means to an end rather than an end itself. 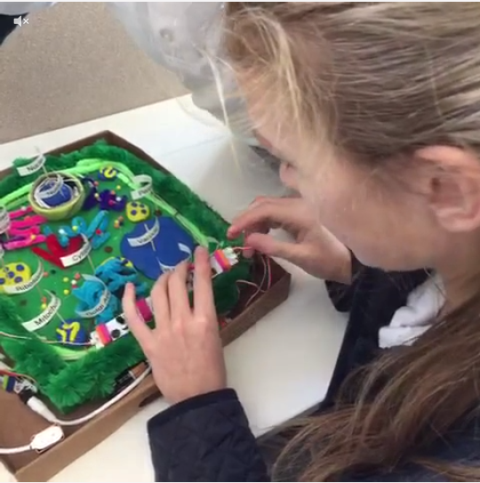 7th grade science students use littleBits to bring cell project to life. If you wandered behind the Kayem Middle School Library, you will see a space not typical of others in the Middle School, filled with mismatched, oddly-shaped chairs, whiteboards and tables on casters, open floor space, and gadgets galore. It is not a quiet space; rather, students inside are talking, collaborating, moving around the room, fully engaged in projects that involve technology in some way. An emblazoned “The Inn” sign hangs on the wall. The Inn–which stands for The Innovation Incubator–is a space designed to inspire collaboration, foster problem-solving, grow ideas, and celebrate process. The obvious difference in The Inn is the use of physical space and furniture. Aside from the four walls, the entire room is completely mobile. Two wall-mounted table tops can be popped up to create mini-work stations near the floor to ceiling windows. The tables have flip-top work surfaces and can be easily rolled into different configurations to redefine the workspace as desired. Two whiteboard T-walls on casters give students the ability to create separate work stations, and the writable surface provides ample space for students to brainstorm, list steps for projects, or sketch designs. Three types of chairs allow students to move like students move–they rock, twist, raise, and squish in a way that is comfortable and energizing. The room itself is light, open, and airy and can take on numerous identities depending on the type of work at hand. Lastly, portable Macbook Airs allow students to work while traveling about the room freely. This flexible space has been used eagerly by teachers throughout the Middle School. Mr. Beckham used the room to hold Socratic Seminars to discuss ideas from the Ender’s Game. Mrs. Zenker and Mrs. Sinclair set up innovation stations utilizing education technology gadgets such as littleBits and MakeyMakey to encourage seventh grade science students to explore different ways to think about presenting projects. Fifth grade history students of Ms. Thornton utilized the green screen wall and iMovie to bring to life reports on national parks. Mrs. Hiltbrand’s yearbook students used the writable walls to brainstorm ideas for pages and themes for this year’s Middle School yearbook. Mr. Gessel’s students used the T-Walls to replicate the cockpit of Apollo 13 for an 8th grade science lesson. The room has even doubled as dance floor for Mrs. Deller’s 6th grade advisory’s Just Dance Advisory Leadership League (ALL) competition. This summer Kinkaid will begin construction on a new multipurpose building that will give the middle school six new 21st century learning spaces and a designated makerspace to accompany The Inn. The makerspace will be fully equipped with ventilation, sinks, and all of the tools necessary to support innovative learning.